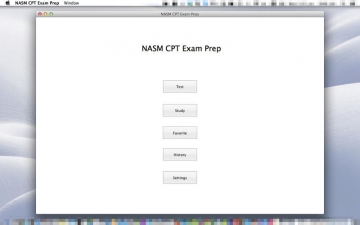 [値下げ] NASM CPT Exam Prep | Mac App Storeのアプリ検索・ランキング BuzzMac! NASM CPT Exam Prep is to help you prepare the certified personal trainer (CPT) certification though the National Academy of Sports Medicine (NASM) . With its exclusive intuitive UI, you can take the mock test and get the real exam experience. The study mode is even better, you can set your own pace and practice anytime you want, get instant response. The best part for this app is it allows you to concentrate on your incorrect questions only. Add them to your favorite module and practice your own weak points again and again, that's way more efficient than the traditional quiz app. You can increase confidence and reduce test anxiety by being fully prepared for the test experience. NASM is a widely recognized and respected name in Certified Personal Training certifications. With the NASM-CPT, learn how to create goal-specific programs, maximize client results and build your business using tools and techniques that countless Certified Personal Trainers have utilized to establish dynamic careers in fitness.